Characteristic fish arches on smooth skerries, potholes, salt baths, and Søsterøyene, or “the Sister Islands,” in the distance. Childlike joy mixed with the waves. It's summer, it's sunny - and it’s the peak season for beach life! We have made the trip to Fredrikstad and Hvaler swimming paradises to give you a full featured menu of the best swimming spots in the archipelago. The outermost islet at Guttormsvauen is highly suitable for diving. 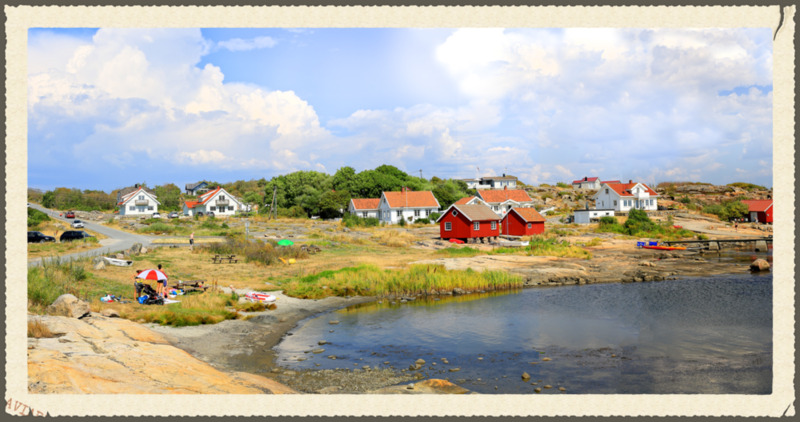 With its 500 m long south-facing sandy beach, Storesand is Hvaler’s largest and most popular seaside resort. The beach is idyllically situated in a large bay on the south side of Kirkeøy. On the great fair-weather days, there can be several thousand people here. More wonderful rocks in the area. Swimming ladder on edge of the rocks in the middle of the beach. Great sand on the beach, but quite a lot of pebbles at the water's edge and beyond. You’ll find a grass area behind the sand beach. For facilities, there is a kiosk with refreshments, nice toilet with water and sink, outdoor shower, grill, trash cans, and separate bin for disposable barbecues. The beach is located on the south side of Kirkøy. Follow the signs to Skjærhalden. The beach is signposted down to the right by Hvaler church when you have almost reached Skjærhalden. Ørekroken has for a long time been the place to be for bathers in summertime. Especially children thrive on the 500 meter long sandy beach, as it is shallow and nice to swim. Ørekroken is adjacent to the beach Storesand. Ørekroken sits on a "horseshoe bay" and is a sheltered beach, but outside of the swimming buoys are often good wind conditions for kiters and windsurfers, which has resulted with Ørekroken becoming a paradise for the kiting and wind surfing community - indeed the most important place in Østlandet. The bathing beach doesn’t have as many facilities as Storesand but close to Storesand and Hvaler’s "capital", Skjærhalden, make sure there isn’t too big of a problem. When driving the highway towards Skjæhalden, you’ll find the exit to the parking lot just after the tunnel. From here, the walk is only 500 meters to the beach.